Can you believe that it's the last week of November? Christmas is coming before you know! So, for this month's Die-namics Design, we are showing you some ideas for Christmas tags using MFT Die-namics! I created a set of shaker tags that look like Christmas ornaments. The tag base was cut with Tag Builder Blueprints 4, and the frame was cut with Stitched Circle Frames Die-namics. The mint candies were made with Candy Jars Die-namics, Smooth White CS, Wild Cherry CS, Limelight CS, and Blu Raspberry CS. (Adhesive Sheets made this process easy!) I also put some six-pointed stars cut from Silver Sparkle CS using Merry Christmas Centerpieces Die-namics. The sentiment from Gift Tag Greetings stamp set was stamped in Chocolate Brown on a Smooth White banner cut with Tag Builder Blueprints 4. I added a bow cut with Creative Clips Die-namics on top of the shaker frame. Visit the MFT blog for more inspiration for Christmas Tags that the other DT members are sharing with you today! 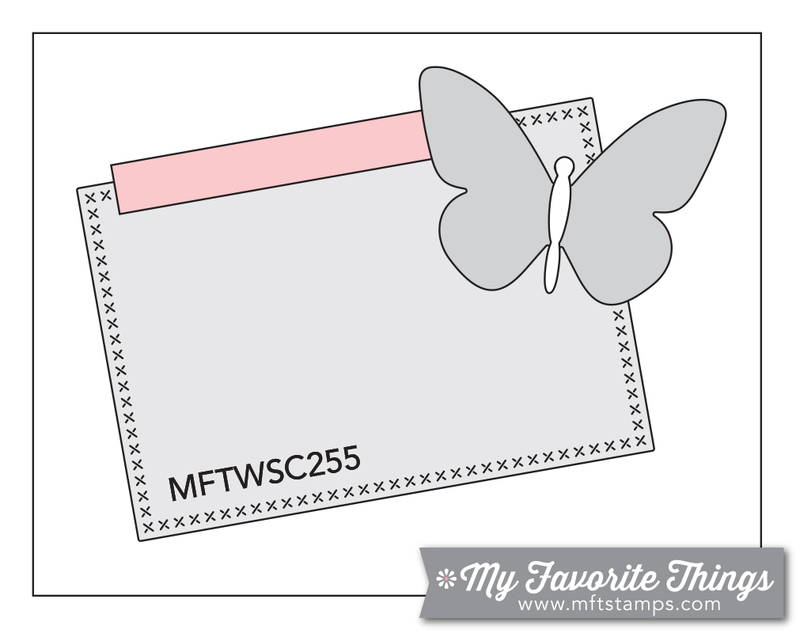 It's time for a new sketch challenge (WSC255) over at the MFT Challenge & Inspiration blog! As you see I rotated the sketch upside down and added an arch window instead of the rectangle panel. I stamped a Tickled Pink panel with Sketched Chevron Background and Tickled Pink Pigment ink. I cut out an arch window from it using Stitched Arch STAX Die-namics, then added a Kraft frame after I applied a piece of acetate to the window. For the background panel I stamped and white embossed several snowflakes, which is from Hug in a Mus stamp set, and daubed some Summer Splash Dye ink over them using an ink blending tool. For my shaker elements I put Tu Tu Pink Prills and Minnie Pearls Prills as well as a few shades of light blue sequins. The mug was made with Hot Cocoa Cups die-namics, Whip Cream CS, Chocolate Brown CS, and Poppy CS. I daubed a little In the Buff Dye ink around the bottom of the mug. The sentiment from Hug in a Mug stamp set was stamped and white embossed on a Chocolate Brown panel cut with Blueprints 20. Make sure you stop by the MFT Inspiration and Challenge blog for the challenge details and for more inspiration from the fabulous Challenge team! I hope you will play along with us this week! I completely went out from my usual style, and even used non-Christmas themed stamp sets for today's card. I cut out a Primitive White panel with Blueprints 24. I stamped the sentiment from Joyous Christmas Sentiments stamp set with Tickled Pink Pigment ink and Tropical Teal Pigment ink, with the help of MISTI. Then I masked the sentiment area and stamped the leaves from Desert Bouquet stamp set and the berries from Fall Florals stamp set. The tiny dots were added with a white gel pen. Make sure you stop by the MFT blog to see what the other DT members have come up with for today!